Provincial Deputy Grand Master, Antrim, 1916-1921. 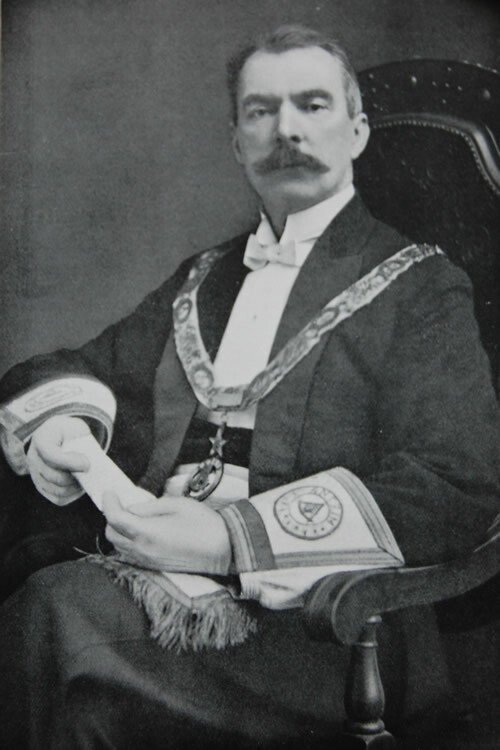 Provincial Grand Master, Antrim 1921-1929. R.W. Bro. James H. Stirling, 32o, was initiated in Lodge 36 in September 1891, and served as W.M. in 1894. He was elected to the office of PSGW in 1901, and acted as a PG Instructor for ten years. When V.W. Bro. Wm, Rankin retires from the P.G. Secretaryship, Bro. Stirling was unanimously elected to succeed him, in which office he received a valuable experience in preparation for a still higher honour, which was conferred upon him by the Provincial Grand Master, Lord Shaftesbury, who nominated him Provincial Deputy Grand master on retirement of R.W. Bro. R.J. Hilton in 1916. For five years he held the office of PDGM, and it was with much satisfaction the brethren learned that the supreme position of Provincial Grand Master had been conferred upon him as successor to Lord Shaftesbury. In this high and responsible position his ability and clarity of judgment found full scope in the government of the Province. He was representative at Grand Lodge of Ireland from the Grand Lodge of Denmark, of which country he was the official Consul at Belfast. In public life he was a member of the City Corporation, President of the Chamber of Commerce, Chairman of the Board of Governors of the Royal Academical Institution, member of the Senate, and Hon. Treasurer of Queen’s University. He was also a member of the Committee of Education, with which the name of Bro. Sir Robert Lynn, M.P., is associated as Chairman. In business life he was managing director of the York Street Mill. In private life he was a genial companion and greatly esteemed.